CITE AS: Flo Laino, "The curious denouement of a ‘grand improvement’," in 100 Minories, January 6, 2015, https://100minories.lparchaeology.com/the-curious-denouement-of-a-once-grand-improvement/ [Date Accessed: April 23, 2019]. The Circus, Crescent, and America Square as depicted by the Rhinebeck Panorama view of London, 1806-7. The close space of the Circus in 1918, depicting ‘Bohn’s Hotel’. Over the course of c.six years 1768-1774, a large Georgian estate – The Circus, The Crescent, and America Square (hereafter referred to as The Crescent estate) – was developed by Sir Benjamin Hammet, and designed by the Architect, George Dance the Younger . Occupying the south end of Minories, a busy thoroughfare leading from Aldgate to Tower Hill, The Crescent estate was heavily bombed in 1940 during the blitz, and finally demolished in 1960 to make way for the City of London Polytechnic School of Navigation, re-addressed as No. 100 Minories. Two hundred years of use has led The Crescent through the Georgians, the Regency, and the Victorians all the way through to modernity. Today the 100 Minories excavation team is excavating a c.180m2 portion of The Crescent to recover the secrets of this once grand estate. 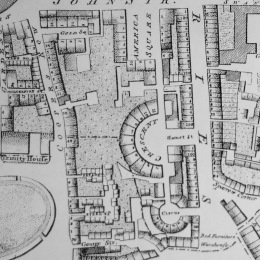 The Crescent estate represents one of the first large-scale residential ‘improvements’ of the Georgian period, as well as one of George Dance’s first town-planning projects in London as the capital’s official City Surveyor, after which followed several other major projects such as the redevelopment of the Newgate Gaol, and the stately Finsbury Circus. Alongside these ‘firsts’ can be listed a further series of clauses as to why The Crescent, The Circus, and America Sq., should be considered as exceptional and unique buildings of their time. 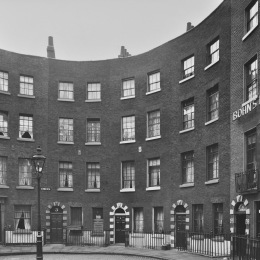 Reportedly inspired by the Royal Crescent in Bath designed by John Wood the Elder, the Crescent at Minories represents one of the first Crescent-forms to appear in London, and certainly the only to exist in contiguous alignment with a Circus, and a Square (Pevsner 1973, 269). 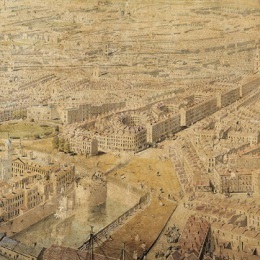 Add to this, its anomalous position in the commercial heartland of capital, the East – a far cry from the majority of the other contemporary estates of its kind such as Bedford Square, or Portland Place, erected in the pastoral, moneyed and unpolluted airs of the West, it seems we have a particularly unique architectural social-history case on our hands. So what is known about The Crescent estate, and its life over two hundred years of use? As yet very little documentary study has gone into finding out about the lives of the people living in The Crescent estate. Some preliminary research has revealed that Hammet had great success in filling up initial leases of the Crescent, whilst the occupancy of such high profile individuals as Nathan Meyer Rothschild at N0. 14 America Square (of the Rothschild banking empire), also attests to the desirability of these buildings to the wealthy and powerful, in just a few short years following its construction. However, whilst everything in the scale and originality of design to these buildings suggests the Crescent estate should rival the elite grandeur of its West End equivalents, it might be interesting as to why, throughout the 19th and 20th centuries, the estate underwent successive phases that suggest anything but an enduring high-class preserve for them. From the demolition of a large swathe of the Crescent and America Square in 1840 to accommodate a substantial Railway Viaduct, and then also the District Line in the 1890s, through several phases of rebuilding in the Victorian period, to accommodating cheap-end pubs and hotels in the 20th Century, evidence suggests here that this once grand ‘improvement’, underwent a long period of social-economic decline. Another set of great articles about the history of the Crescent have been published here, on ‘The Commuter Consultant’. Pevsner, N. (1973). The Buildings of England. London: Volume One, The Cities of London and Westminster. Harmondsworth: Penguin. Stroud, D. (1970). George Dance, Architect, 1741 – 1825. London: Faber & Faber. Anon. (c. 1806 – 1808). The Rhinbeck Panorama. Available at: Museum of London Online . Reproduced with the permissions of the Museum of London.